For me, it was fun to actually see the details that I missed when the hall was mobbed and my only thought was looking up or figuring out which direction to go. 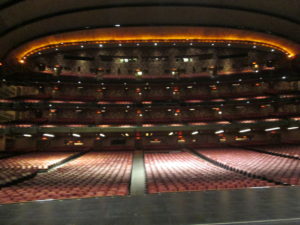 Sitting in and walking through an empty Radio City Music Hall is a blessing, since many people’s only experience is seeing it when it’s so mobbed you couldn’t fully take it in. 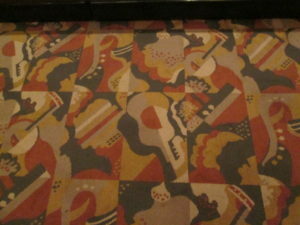 One thing that’s hard to appreciate when you’re milling about the lobby area before a show, is the carpet. Seriously, the carpet. Look down. 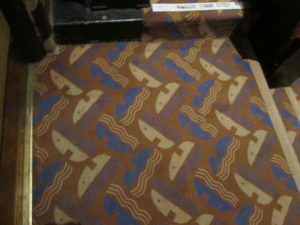 It’s designed by Ruth Reeves and is called Still Lives With Musical Instruments (yes, the carpet is titled – Google it – it’s fascinating). Look carefully and try to identify the six instruments. Here, we’ll help: guitar, banjo, sax, accordion, harp, clarinet. Look up to see the 40’x60′ foot mural behind on the grand staircase. It’s called the Fountain of Youth. It was painted on a Brooklyn tennis court (not literally on the court, but on canvas lying on the court) and transported piece by piece to Radio City. The Radio City Music Hall was built in 1932, one of what eventually became 19 buildings making up Rockefeller Center. The hall initially showed films, but within a year, featured the Rockettes’ Christmas Spectacular, which debuted in 1933. This is where the Tonys are held, and used to be the location of the NFL draft and America’s Got Talent. 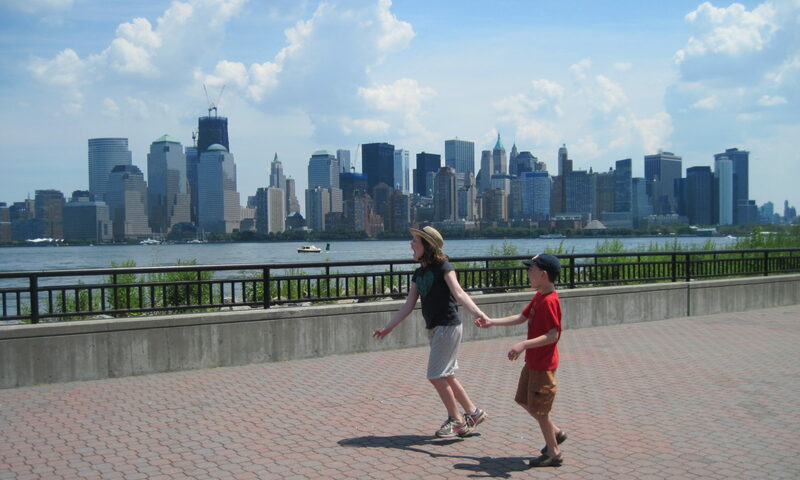 We saw Cirque du Soleil here, as well as the Rockettes and Weird Al. 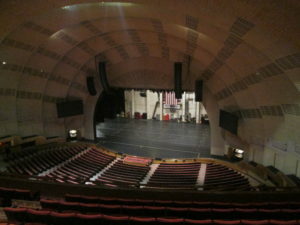 During the tour, you’ll see a 1924 model of Radio City with a working stage, lights and hydraulics, which they sometimes use to test lighting and sets. Walk down the stairs, and you’ll see a lower lobby with dim lighting and a diagonal pattern. 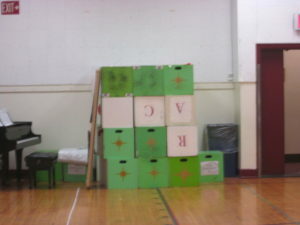 It was intended as a holding room between shows. To keep people’s voices down, they designed it with the dimmer lighting and with the idea that the diagonal patterns and mirrored columns would keep people quieter. The lower level bathrooms (which previously I had not been in due to immense crowds) are spectacular. The women’s lounge is large, with two seating/primping areas. 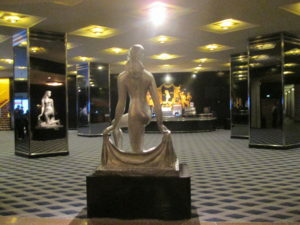 One is painted with murals titled The History of Cosmetics, and the other room is lined with mirrors and small chairs and tables, presumably to actually do your makeup. 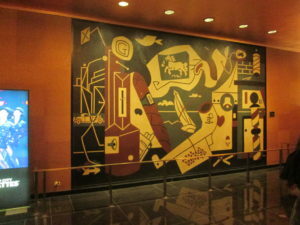 The entry to the men’s room holds a giant Stuart Davis painting on the wall – yes, I went in during the tour (but just far enough to ogle the painting). 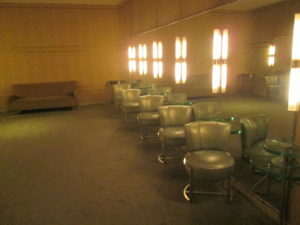 The Art Deco chairs in that foyer were fabulous as well. 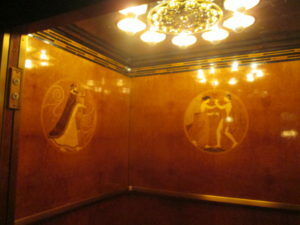 Over to the elevators, a trio (I think) with gorgeous inlaid wood. All the elevators are identical inside. 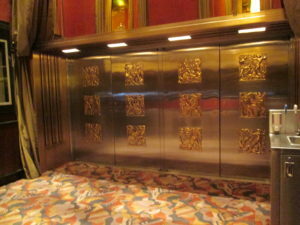 Until 2006, the elevators were hand operated. Inside you’ll see hardwood inlaid pieces, with no paint or stains. They’re called called Wine, Women and Song. At one point in the tour, you go up to the third mezzanine, last row. The hall was designed so there are no bad seats. The acoustics go both ways, and performers can be heard from stage with no microphones. 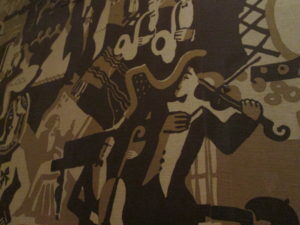 Even from the back, the building is spectacular, both the carpeting and the wall tapestry. 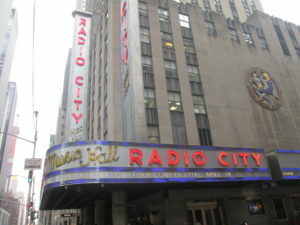 During the Radio City Music Hall tour, you’ll watch a short movie which talks about the Rockettes’ history. They started out in 1925 as the 16 Missouri Rockets, doing precision dancing. They moved in 1927 to the Roxy Theater in NYC, increasing the number of dancers to 32, with a name change to the Roxyettes. Their choreographed routines included tap and jazz. In 1933 they began their Christmas Spectacular, and the toy soldier falling scene has been a regular in the show since then. The dancers have to be 5’6” to 5’10.5”. They have the illusion on stage of being the same height. They do 300 kicks per show, and dance 6 hours a day, 6 days a week. They have 8 costume changes. The fastest costume change is 70 seconds and they change in the wings. Each year the current Rockettes have to audition, along with potential newcomers. About 500 women audition per year, for 80 spots. They begin rehearsing in September, for an early November opening. There’s a morning and nighttime cast, and each cast does 2-4 shows per day. (More interesting facts about the Rockettes). Rockettes during the Christmas Spectacular. Photo courtesy of the Rockettes. Yes, you get to meet a Rockette and ask her the same questions that everyone else asks her multiple times a day. You can get a professional photo with her ($20 for one copy, $25 for several and the digital version) and you can’t use your own camera. 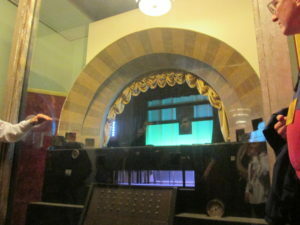 Backstage during the Radio City Music Hall tour, you’ll go up and down stairs, passing by the costume shop. 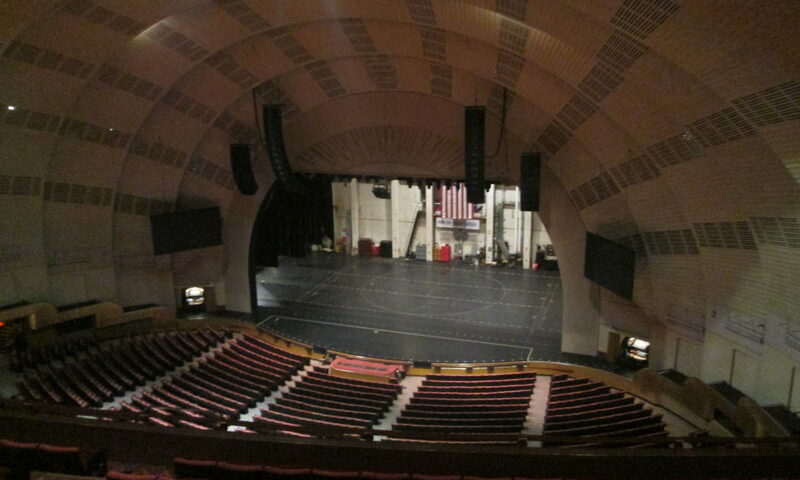 You’ll go into one of the rehearsal rooms used by the Rockettes and any of the other performers at Radio City. 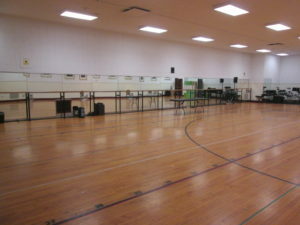 The rehearsal stage is the same scale as the main stage. 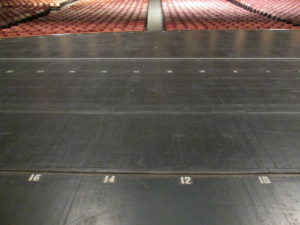 You can see the grid patterns on the floor and color lines that would be on the stage too. 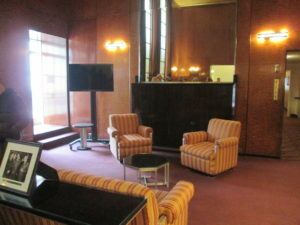 Toward the end of the Radio City Music Hall tour, we saw the VIP lounge, which was initially intended as an apartment. There’s a dining room area, fancy mahogany paneling and a guest book with many famous signatures from different eras on two large pages. I think it’s fake. 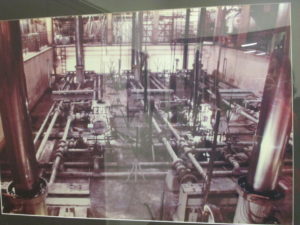 While we didn’t get to see the hydraulics system in action, we learned that a lot of the backstage stuff happens on the Otis hydraulics system, which is declassified war technology. The USS Intrepid uses this technology too. The guide is willing to answer any questions, and was quite knowledgeable. I asked about the animals from the Christmas Spectacular. He said come from a rescue organization (including the camel???). They build stables for them. There’s a loading door for the camel. The sheep take an elevator ride to get to the stage. Read more about the Christmas Spectacular animals. He designed the princess telephone – you probably had one in your house growing up! Some more fun facts about Radio City here. Tickets: Full price adult Radio City Music Hall tour tickets are $30, and $26 for kids 12 and under. 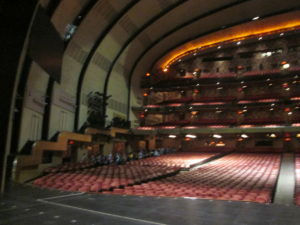 You can search for discount Radio City Music Hall tour tickets here. 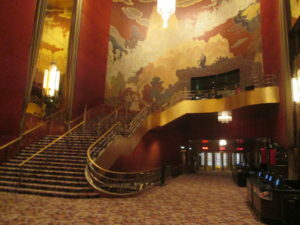 Times: Radio City Music Hall tours are frequent, about every 30 minutes from 9:30-5. You may not get to go into the seating area if they’re prepping for a show. Accessibility: There were a lot of stairs (not exhausting, but some up and down), but the guide would make accommodations with an elevator for those who weren’t able to use them.